Easton resident Debbi Barer and Ridgefield resident Anne Crane participated in a "Vigil to Stop Kavanaugh" at the Ruth Steinkraus Cohen Bridge in Westport on Oct. 3. 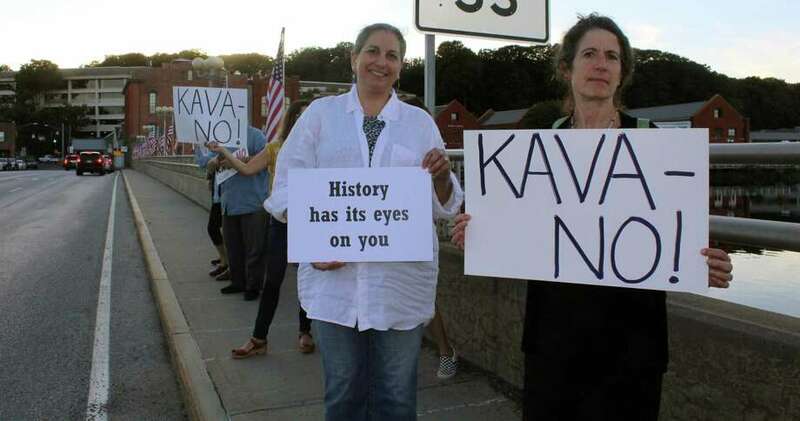 WESTPORT — At the sunset of an FBI investigation into Supreme Court nominee Brett Kavanaugh, residents from all over Fairfield County gathered at the Ruth Steinkraus Cohen Bridge on Oct. 3 in Westport to protest Kavanaugh’s pending confirmation. 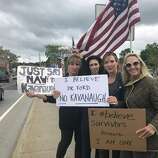 Organized by the resistance activist group Indivisible Connecticut District 4, the “Vigil to Stop Kavanaugh,” was part of a national vigil, an email sent to ICT4 members earlier on the day of the protest read. “It has been difficult to watch the goings on over the past several days and not having a feeling of moral outrage. So here is a chance to convert that outrage into action,” the email read.